CEO Vineet Nayar is dedicated to making his workplace a democracy. It's a concept that could bring about a corporate renaissance, he says. • Let go of command and control. In business, as in nations, dictatorship is out. Democracy is in. • Business leaders must be open to criticism, just as elected officials are. • Customers don't come first, employees do, because employees are the product that your customers are buying. • Democracy and feedback allow employees and managers to gravitate toward their strengths. 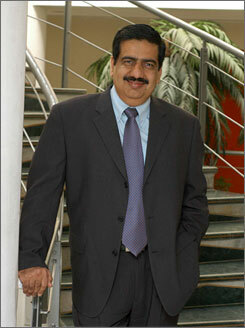 • Joined HCL as a management trainee in 1985. Named president in 2005, and CEO this October. • Holds bachelor's degree in technology from G.B. Pant University ('83), and an MBA from XLRI-Jamshedpur ('85) in 1985. Both schools are in India. • Married. Kids ages 15 and 13. • Likes adventure sports. Has done glacier trekking in the Alps of Europe and in New Zealand. Favorite scuba destination: Hawaii. • Favorite books: The Black Swan: The Impact of the Highly Improbable by Nassim Nicholas Taleb; The Starfish and the Spider: The Unstoppable Power of Leaderless Organizations by Ori Brafman and Rod Beckstrom. • Favorite city is New York. Favorite country is New Zealand. • HCL employs 45,600 workers in 17 countries, up from 36,400 one year ago. In the latest quarter that ended Sept. 30, revenue grew 43% to $429 million. Net income rose 42% to $77.4 million. India is the world's largest democracy, so it seems fitting that the New Delhi-based information technology services giant HCL Technologies is attempting what may be the most ambitious effort yet at installing a workplace democracy. That may sound impossible, but so did running nations as democracies in past centuries. CEO Vineet Nayar, 45, has written a case study about HCL's experiment for the Harvard Business School. He spoke to USA TODAY corporate management reporter Del Jones about his bold experiment and why he believes that in the future, democratic companies will outperform the command-and-control dictatorships that have persisted since the industrial revolution. Q: When can I vote my boss in or out of office? A: That would be a disaster. Rather, business should borrow from democracies the concept of reverse accountability. Just as elected officials are there to serve the public, management should not be commanding employees to create value. Nelson Mandela and other great political leaders understood that their job was to enable people to find their own destiny. Q: Sounds like a recipe for anarchy and chaos. A: Employees aren't free to do whatever they choose. But if they want to collaborate with someone in Hong Kong, they don't need permission from hierarchy. What we are changing is leadership's accountability to the employee. Employees remain accountable to the organization. What changes is the loss of command and control. Q: Be honest. Shouldn't leaders have ultimate power, even if it's in their back pocket? A: Command and control is the easiest management style. It may not be the most productive for the company, but it is very easy. The democratic, accountability model is very difficult on management, but it's very productive. Leaders must see themselves differently. Q: If employees can't vote the executive bums out of office, then what can they do in a corporate democracy? A: Any of our employees can open a trouble ticket on anyone in this company, on (human resources), on payroll, on a manager, on anyone. Those with trouble tickets have to respond. It's like a customer opening a trouble ticket. A response is required. Otherwise, some departments can become gods in an organization, because they control the power. Q: What do you do to respond to your employee constituents? A: I volunteered to display the weaknesses of my 360-degree feedback for all employees to see. A lot of people said I was crazy to make it public. I encouraged my senior managers to experiment with the same idea and overcome the fear of having their flaws exposed. We launched it with a positive mindset, not an evaluation mindset. If you launch it to unlock value, for the purpose of collaboration, people love it. You don't destroy the hierarchy, you increase the accountability of leadership to employees the same way as it is in a democracy. Q: Sounds like workplace democracy is just a version of putting employees first. What happened to the customer always being right? A: In our business, employees are the products. Customers come to us for our employees. When we say employees first, customers second, what we are saying is that we as management will create systems and methodologies to nurture employees and allow them to create more value than anybody else can create. People used to say the customer is always right, but we have moved away from product to experience. It's a different paradigm. Who creates the value for the customer? Who does the customer want to deal with? Who is the organization for the customer? The employee. What kind of company does a customer want to deal with? The one where the employees are most important. Q: Nation democracies have been around since ancient Greece. If workplace dictatorships were not best, why have they persisted for so long? A: In manufacturing, it's been command and control, because it is a single process. In service companies, especially knowledge-based service companies, the value gets created in the interface between the employee and the customer. When you travel on an airline, it is not the CEO who makes a difference. Q: What about shareholder democracy? A: Management started becoming more accountable to shareholders 20 years ago. Companies have only become better. That democracy, or reverse accountability to shareholders, has brought positive energy into the stock market, and a huge amount of value has been created. It has not created chaos. Shareholders are not telling business what do, but it has created a higher accountability. The same principle applies to employees in knowledge businesses. It unlocks energy, ideas and growth. Q: Do you know of other companies that have tried workplace democracy? A: I'm not aware of any. A lot are in the process of understanding it and trying it, especially our customers who have seen the change in our employees. Q: What do you do with the employee underperformer, the slacker? A: There is no difference in the way we handle underperformers. Sometimes, you still have to let people go. People have more opportunities to succeed in this environment than they do in command and control. They gravitate toward their natural strengths, rather than being suffocated in a job they are not aligned with. But if they underperform despite the enabled environment, the outcome is the same as a command-and-control organization. Q: How about weeding out bad managers? A: If I constantly get feedback that I'm a poor manager, I'm going to look at other options, such as becoming an individual contributor in a technical role. I will gravitate to that area because of the feedback. Then, maybe I start excelling at something else. With this system, you come to know whether you are a good manager or not, whether you have good communication skills. You can work on your weaknesses, but most people I've seen gravitate toward their strengths. Q: You have workers all over the world. Will workplace democracy be easier to implement in some countries than others? A: India for centuries has been a command-and-control society. We even control our kids for 10 more years than you control your kids, at least until age 27 or 28. We run their lives until they get married. Similarly, the workplace in India is very command and control. I believe it's easier to introduce workplace democracy in Europe and the USA. As a society, the U.S. is more open to feedback. It gravitates more easily toward its strengths. But eventually, democracy works everywhere.